Demos as known to me, have their own unique format. If you do want to record a part or your whole demo for some reason, you will probably need to do that with a software (e.c. Fraps) that has nothing to do with Soldat. * Make demos easier to open, meaning there would be some in-game feature to open demos, just select from list (Maybe add 'Demos' menu to GUI). * Double click 'demo.sdm' will open demo in-game. * Have a visual interface with buttons such as: play, pause, rewind, forward, record, volume. Instead of messy keyboard setup. * Re-order the keyboard controllers for pause/rewind in some normal order. It's just spreads all over the keyboard. * Record button will export some video format (popular and considered good quality) into X:/Soldat/Demos/Recorded/x.avi for example. * I tried pressing 'W' while watching a demo and free camera didn't apply... is there a way to add free camera? * Soldat currently forces you to watch demos on full screen, any way to enable windowed mode? * I just watched a demo and tried to press 'Left Mouse Button' in order to see other players. disabled. any way to enable that? I hope these points are executable, and I'm sorry if I'm really off from this all coding thing. I really just don't know anything about it, but these are good ideas generally. Hopefully executable. * Have an inner option to control the demo while watching, interface for: play, pause, rewind, forward, record, volume. I have a list of bugs/ideas that can be done with demos. I will add this to my list, my plan was to get the devs to do an update focused only on demos, perhaps after we get auto-updater. I re-wrote some of the stuff from the original post to make it a bit clearer. And also added some new points to it in this post. Hopefully one day, the demos system will be great again (or, well, it'll be the first time it's great heh). Dedicate an in-game screen menu to demos-playback. As well as enable demos to be opened directly by double clicking an .sdm file in the demos folder. CS:GO's UI for demo playback. Adding this would be a huge improvement. Could also add a bunch of keyboard shortcuts to control that demo playback, might be more comfortable for some. If recording could be done in-game it'd be awesome, there'd be no need for players to use third party programs for that no more. Record button would export to Soldat\videos\ . Enable the ability for demos to play on Windowed Mode. Enable scrolling between players with the mouse-wheel. Keyboard shortcut to toggle Chat, Kill Log & Interface on and off from the demo's screen, providing a cleaner look and more appropriate for soldat videos. 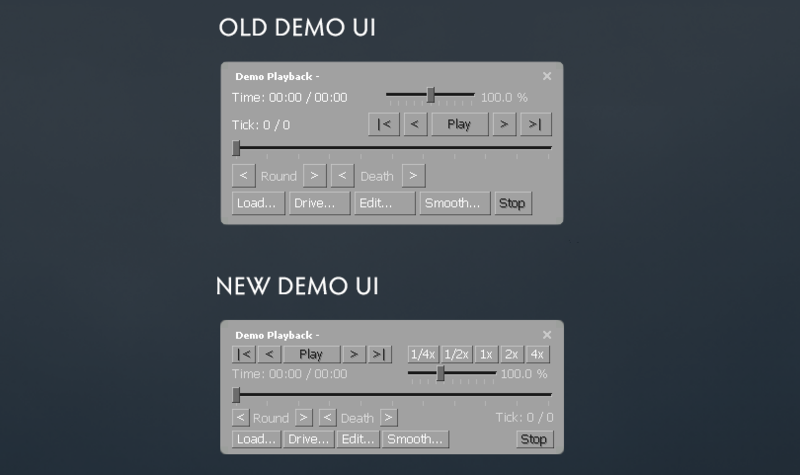 Could also add an option to the Demo Playback screen (in GUI) to toggle Clean Mode. Firstly, I think it's interesting for some people to see how others aim in a demo but the demos aren't really recording the crosshair's movement in it. And secondly, much like Clean Mode, add the possibility to toggle crosshair view in case it is unwanted for that video. Keyboard input like in here? that'd be awesome. I agree with chox, nosejj and homerofgods. Changing speed would be nice and jumping between times would be also nice and easier for people who know the demo. -Instead of hiding every text, being able to choose them would be nice. For example just letting the killfeeds be, also we can't hide taunts rn. -Putting keyframes to create smooths in free lock would be nice. It is hard to create smooth movements with the mouse. The mouse movements goes A LOT smoother when in Free Cam. It's weird, you can barely follow the action with precision. Yeah going smooth but not when u speed up suddenly. Watch the trailer's beta, at 0:40 even though i tried recording that scene several times it is still not smooth . I don't know exactly how the demo data works but in CSGO the Match Making demos are 32 tickrate while the server is 64, which causes a lot of crosshair smoothing. I guess Soldat demos capture less data than the ideal, the players warps a lot and if we could see the crosshair it would be bad because it won't show the movement close to the real action. That's why I think devs could increase the data captured, not only for this crosshair addition but for a better replaying of the actions. Ummm there is no option at the moment to record how the players aim during the game right now, it doesn't follow the pattern the mouse was moving. Is this a part of what you mean by "increase the data captured"? adding this? No. Nowadays the demos don't record the crosshair and there are still players warping a lot (plus other problems). If they add the code to record the crosshair, the crosshair recordings gonna use part of the current data amount recorded which means the old inaccuracies could increase. That's why I'm suggesting the increase of the demo 'tickrate'. Page created in 0.193 seconds with 19 queries.